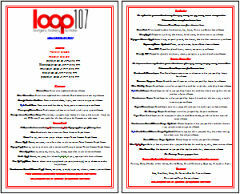 Welcome to the loop! Inspired by the everyday family cooking that we grew up with, you will feel at home while savoring a great meal in our casual and relaxed environment. Experience our inventive cuisine, attentive service and a friendly atmosphere. Come see what all the talk is about. Fried pies anyone? You betcha, we've got it! So come on in, Lettuce Lasso Your Appetite! Located in the heart of beautiful Adkins, Texas proud owner Trina Hayes-Davis invites you to come & experience country dining at its absolute finest! 'Hungry yet? 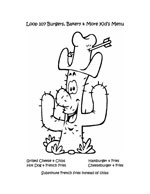 Take a look at our menu!' Call us for to-go orders! Monday - We are closed. Please don't cry! Tuesday - We are closed. Please don't cry! 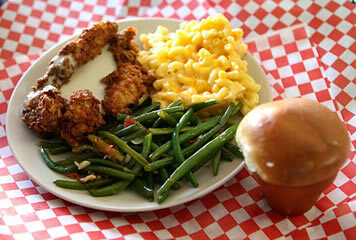 Wednesday - Chicken Fried Chicken with country gravy, green beans, our "flour" pot roll & macaroni & cheese. Thursday- We are closed. Please don't cry! Friday - Fried Fish, french fries & cornbread with our homemade tartar sauce. Saturday - Chicken Fried Chicken with country gravy, macaroni & cheese, green beans & our "flour" pot roll. Sunday - Chopped steak with brown gravy, mashed potatoes, green beans & our "flour" pot roll. We can cater parties of any size! We have done it all: from Marines, to teachers, to weddings and even back-yard barbeques! Whatever occasion and whatever size, we've got you covered. We have several menus to choose from.